Click HERE to access an interactive map for the former Southern Lines of the Adelaide tramway network. E1 type tram 120 waits for inbound F1 type tram 269 to enter the double track section of the Glen Osmond line in Glenunga, Glen Osmond Road in 1951. The busy intersection at Glen Osmond Road, Portrush Road, Cross Road and the bottom of the South Eastern Freeway today may seem like a very unlikely place for a tram terminus but between 1884 when the first horse tram arrived and 1953 when the replacement electric tram service was finally closed, trams ran right up to what is now the bottom of the freeway. Originally operated as a horse tramway by the Adelaide and Parkside Tramway Company, the line was acquired and converted to electric operation by the Municipal Tramways Trust with services initially running to Parkside by November 1909. The rest of the tramway to the Glen Osmond terminus had been coverted to electric operation by July 1911. At 482 feet above sea level, the Glen Osmond terminus was the highest point reached on the Adelaide tramway system. Like some of the other tramways running to the base of the Adelaide Hills, the Glen Osmond tramway was popular for sight seeing tourist traffic and to further encourage this, a 'Refreshment House' was proposed to be built at the corner between Glen Osmond Road and Portrush Road in 1910 next to the tram terminus. Construction of the 'Refreshment House' never occured. St Pauls Retreat Monastery near the tram teminus also created additional tramway traffic whenever a special event was held there. Only one week before closure of the tramway in October 1953, a total of 16 'Drop Centre' trams were lined up at the terminus to help carry the large number of worshippers home. Seen in the leafy green surroundings of the Springfield terminus, the tram crew of 'Drop Centre' 266 can be seen preparing for the return journey to the City and eventually Paradise, c.1951. When the horse tramway network was being built around Adelaide, Fullarton Road never had tracks laid down the road. A horse bus service run in part by the Adelaide and Parkside Tramway Company connected with the Parkside (later Glen Osmond) horse tram and provided some of the first public transport on Fullarton Road, terminating at the intersection of Fullarton Road and Fisher Street. After the Municipal Tramways Trust acquired the Adelaide and Parkside Tramway Company, the horse bus service was maintained for several years after the Glen Osmond tramway was electrified. Fullarton finally received a proper tram service in 1914 when a new electric tramway was built with a slight extension beyond the former horse bus terminus to the intersection of Fullarton Road and Cross Road. Originally built as a single track line, the Fullarton line was double tracked by 1924. In the mid 1930s, the new suburb of Springfield was developed and the Mitcham Council was keen to see the Fullarton tramway extended further down Fullarton Road to serve this new area. Management of the Municipal Tramways Trust was initially sceptical about the proposal as the number of passengers needed to make the line viable didn't appear to be there (especially with the terminus of the Mitcham line being a few blocks away in the same area). A 5 month trial with a bus service connecting with the Fullarton trams appeared to validate the MTT's scepticism. Further negotiations between the Mitcham Council and the MTT evetually saw a single track extension run south of Cross Road, terminating at Hill Street, opened in July 1938. Part of the agreement to build the tramway was for the Mitcham Council to provide an annual subsidy for the operation of the line but traffic on the new extension defied expectations and the subsidy was not needed after 5 years of operation. Tram services to Fullarton/Springfield finally ceased in July 1958. D type tram 191 at the Kingswood terminus in June 1951 with the tram being readied for the next inbound trip to the City and eventually Findon with which the Kingswood service was through routed. The suburb of Kingswood had barely been developed when the first electric trams started to run in Adelaide and grew rapidly prior to the First World War. Unlike most of the other tramways in Adelaide, the line to Kingswood was never worked by horse trams and was opened as a new electric service in March 1917 and ran through George Street, Duthy Street and Harrow Street before terminating at Kyre Avenue in Kingswood. The construction of the line through George Street caused a few problems owing to the narrowness of the road which would only allow for a single tram track to be laid. This short section of single track in the otherwise double track tramway made the use of tramway 'Forest City' tramway lights (basically dedicated tramway traffic lights) a necessity to keep trams from running in to eachother. The local, light weight nature of the roads that the Kingswood line ran through delayed the closure of the tram service for a few years as the new diesel buses being introduced would have been too heavy for the streets. Eventually the Mitcham Council, Unley Council, State Government and the Municipal Tramways Trust all contributed to the cost of rebuilding the roads to allow the new buses to replace the trams which ran for the final time in July 1955. 'Drop Centre' tram 205 is seen here in Unley Road heading towards Mitcham in the mid 1950s. Some elements of this scene have remained the same since the trams ceased running on Unley Road with the two churches on the left of the road still standing. The present day Coles Supermarket would be where the local shops are on the right of this shot. Photo: Keith Kings. Mitcham was provided with one of the earliest horse tram services in Adelaide with a line from the City down Unley Road being opened by the Adelaide, Unley and Mitcham Tramway Company in 1879. Like the other early horse tram companies, the trams were imported from John Stephenson and Company in New York. As a trial, a Baldwin steam tram 'motor' was also imported ready for the start of traffic. With the upper decks of the horse trams being open to the elements, passengers naturally found the smoke and soot produced as a very unpleasant feature of the journey and conventional horse traction was instead used for all regular services. The steam tram was sold by 1885 for use in Sydney where a large steam tram system had been developed. Despite the setback with the steam hauled trials, the company prospered and and eventually ran a fleet of 16 horse trams. As with the other horse tram operators, the Adelaide, Unley and Mitcham Tramway Company was acquired by the Municipal Tramways Trust for the conversion of the service to electric operation. Originally electric trams only ran as far as Cross Road by November 1909 but the rest of the line to the former horse tram terminus in Albert Street, Mitcham by 1911. In the interim, horse trams continued to run between Cross Road and Mitcham. A spur line was also constructed from the new electric tramway at this time serving Unley Oval, running along Oxford Terrace to the gates of the Oval. The new spur line was ready for the start of the 1910 Football season in May that year. The line to Mitcham was one of the main routes in Adelaide and remained in use until July 1958 when it was closed and replaced by buses. F type 'drop centre' tram 219 in Tuscan and Red at the Hyde Park terminus at the intersection of Whistler Avenue and Cross Road before running inbound to the City and eventually through to Walkerville North, July 1951. Tramway services to Hyde Park commenced in 1883 when the Adelaide and Hyde Park Tramway Company commenced operations down King William Road to intersection of Northgate Street at the northern end of Heywood Park. The line to Hyde Park was converted to electric operation with services commencing in July 1909, only four months after the first electric tram services were inaugurated in Adelaide in March that year. For the first 15 years, electric tram services ran to the former horse tramway terminus. In late 1923, the tramway was extended through Heywood Park running on 'reserve track' (a tramway term for track that doesn't run through a street) before running through Whistler Avenue to the intersection with Cross Road. This new extension was opened for service on the 27th of January, 1924. Tram services to Hyde Park ceased in November 1955. A City bound 'Drop Centre' car is seen approaching the end of the reserve track section that ran through to the Col Light Gardens terminus. Photo: Keith Kings. The Goodwood electric tramline was built in 1912 along the southern side of the then Glenelg railway to avoid a level crossing at Goodwood Road. To avoid another level crossing, a subway was built under the Hills railway at Millswood, allowing trams to Clarence Park in 1915. In 1917, world famous planner Charles C Reade designed Colonel Light Gardens on the site of the First World War Mitcham army camp. 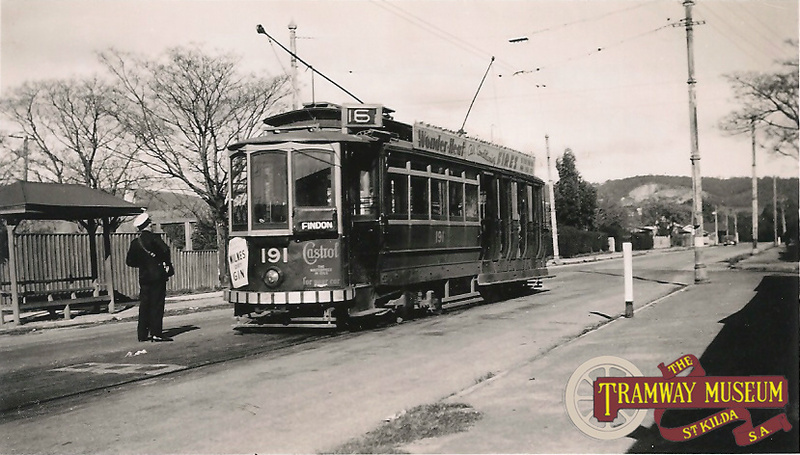 Started in 1924, provision was made for a tram line from Clarence Park to a new Colonel Light Gardens terminus at Springbank Road using a private reservation on the east side of Goodwood Road. The line opened in 1927. A toilet for crews was built at the terminus. Buses replaced the trams on 8 December 1957. Soon afterwards, the tramway reservation became a dual roadway for the rapidly expanding 1960s motor traffic from the south. Cars had taken over!